Safely and efficiently move your trash can or recyclables to the street or curb for pickup using the TigerChef Black Round Plastic Trash Can Dolly with 5 Casters. Boasting a twist and lock system, this dolly securely attaches to your round trash can for secure transport. 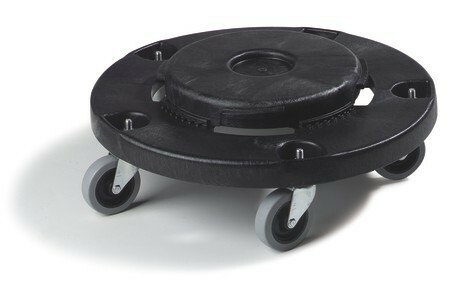 Thanks to its 5 roll-able casters, this dolly easily glides along indoor or outdoor surfaces. Made from lightweight plastic, this dolly will withstand heavy duty use making it a great addition to any high-volume setting. Dimensions: 18" Dia. x 6" Ht. Good quality, and fast service! Quiet and does the job! Will a Rubbermaid Feed Seed Can attach to this Dolly? What are the dimensions of the part that attaches to the actual can. Any 20, 32, 44, or 55 gallon trash can will fit on it. It measures approximately 11" with the snap part. What is the maximum weight rating for this can dolly? It fits 20, 32, 44, and 55 gal containers. It can easily hold 200+ lbs (we haven't maxed out a weight yet). $33.82 Winco DWR-1708 Wire Cart for Trash Cans 17-5/8" x 8-7/8" x 6"